Roger Sigler, innovator and business entrepreneur for most of his adult life, has always been actively involved in animal training. As an active member of the German Shorthair Club, he field trialed his own dogs for years. In 1968 he started training professionally and over the next 38 years trained hundreds of dog. Sporting breeds were his specialty; pointers, shorthairs, setters, Labradors, etc. To expand his training as much as possible he spent every year for the next 25 seasons on the Canadian prairie with his string of dogs. His interests in training lead him to work in other training venues, such as Schutzhund, a German discipline focused on guard, obedience and scent work. 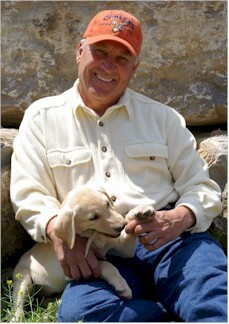 Roger worked with many of the top scent dog trainers, nationally. He has spent hundreds of hours in seminars and hands-on courses with experts like Marian and Bob Bailey and Ogden Lindsley. He expanded his training knowledge by working with marine mammal trainer, Dr .Jennifer Hurley, Ph.D., at her Marine Mammal Training Center in Moss Landing, Ca. After years of study and all the while working with dogs, horses, and mules, Roger developed his own technique of animal training. Using no force or harsh treatment of his animal students, has allowed him to gain their trust and co-operation so that they enjoy the task that they are asked to perform. In 2005 Roger agreed to work with the inmates at the Kansas State Prison on a program called Safe Harbor. The program was designed to rescue dogs from shelters and prepare them for adoption and active family life. At any given time there were 50 dogs being handled by 35 inmates. He worked with the inmates and dogs to help them fit into society. He has also worked with others who had trained everything from bomb detection, drug dogs, and search and rescue. With such a diverse background Roger felt that it would be possible to expand the world of dog training into the sport of shed hunting. Normally in today’s high tech world, all one needs to do is go on line and get all the help they need, but that wasn’t the case with shed dogs. There was no information available. It was his thought that with his knowledge and abilities, certain breeds of dogs could be trained to find antler sheds and today he is proving his belief. He currently has 15 dogs at various stages of training. Roger was recently featured in North American Whitetail magazine and at seminars at the new Cabela’s outfitters, in Kansas City. Read the article!